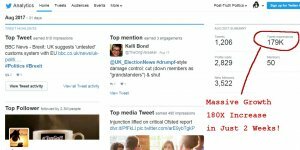 Earlier this year I wrote an article on how to quickly build a popular Twitter account which includes a screenshot from one of my political Twitter accounts showing half a million Twitter impressions. 9 months later and the Twitter account has had a baby, it’s doubled the Twitter impressions to over One Million Twitter Impressions in a month, not bad for an account that’s one year old. 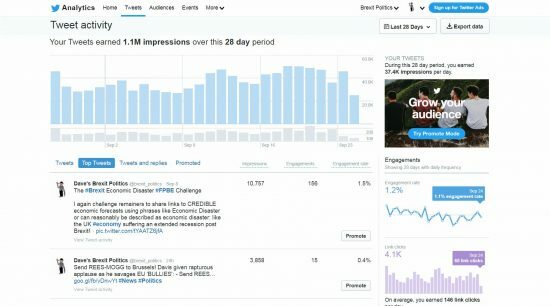 To achieve one million Twitter impressions a month I’ve worked on the account most days (I enjoy politics, it’s a hobby). The account has over 20,000 followers, this was achieved by following most (not all) accounts that followed the account. I used a none aggressive follow/unfollow growth followers technique. Probably averaged following 100-250 Twitter accounts most days and when I couldn’t follow more accounts (due to Twitter limits) I’d unfollow accounts that weren’t following back within 10 days of following them. At first this is a lot of effort to manage, but as followers grow it gets easier, I’d clear out accounts not following back two or three times a month. I Tweet a LOT, since it’s politics it’s easy to find news articles etc… to share. 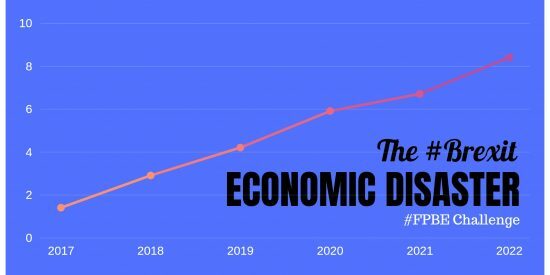 The account is about Brexit Politics (hot topic in the UK right now). I voted Leave in the EU referendum and still support brexit, but I have no bias in what news articles are shared: basically I Tweet everything Brexit relevant. My own Tweets and Replies are Brexit biased, but most of the Tweets cover whatever is available at the time. The problem with this is the Twitter impressions are for content from news sites (BBC, Telegraph, Guardian etc…) and if a Twitter users clicks the link it takes them to the news site, NOT one of my websites! 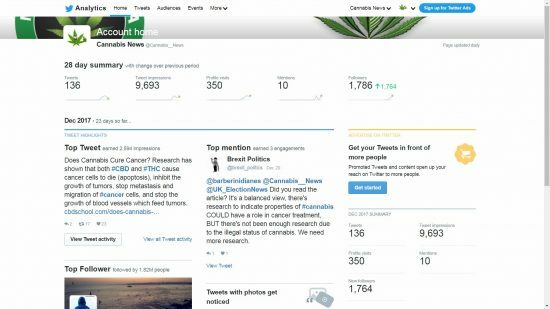 So though the account has one million impressions a month and thousands of clicks to visit the shared articles, very little of it benefits my network! 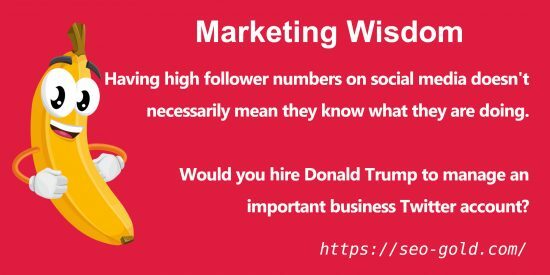 It might be OK for a big brand to have a lot of traffic on Twitter etc… but for a small business to directly benefit we need the Twitter user to engage with the Tweets AND visit our websites etc… not stay on Twitter. My Brexit Politics account doesn’t achieve this, I have the odd Tweet sending traffic to my sites (example below), but most stays on Twitter or goes to a news site! 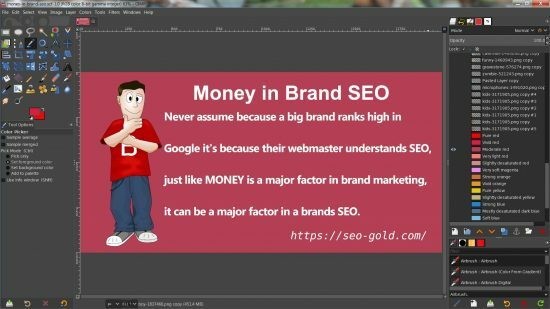 I use similar techniques on my other Twitter accounts, for example @SEOGoldUK is my main SEO Gold business Twitter account and exists to promote this website. 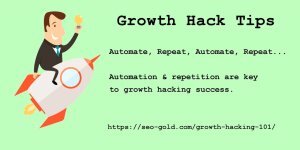 I use the same follow back growth technique described above, but where the Brexit politics account is a hobby Twitter account, the SEO Gold account is business and so I don’t share everything I can find about SEO: I’m not looking to send social media traffic to the SEO competition or news sites! 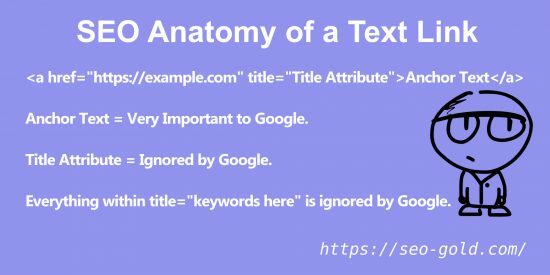 Since I don’t randomly share anything about SEO I needed to build a lot of content to support this website and with over 15 years of researching and writing about search engine optimization I had a LOT of content to work with. A month or so ago I went through every article on this website and pulled out snippets of text suitable for Tweets. Surprisingly there was lots to work with, was easy creating hundreds of Tweets. Was then a relatively simple task to create a database of Tweets to support this website (over 1,200 Tweets and counting: every new article means more Tweets). 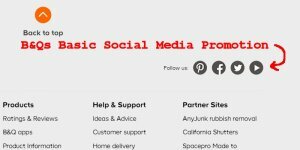 Since just text based Tweets would make for a boring Twitter account and a text based Tweet won’t link back to this site, the Tweets are a mix of pure text (general quotes and SEO tips) and links to articles on this website. 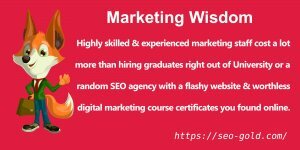 I also found a couple of hundred SEO/marketing type quotes from others and used them for simple Tweets to mix things up a bit. To make the images shared over Twitter bright and colourful I created a sort of GIMP Meme Generator Template (GIMP is a free image editor) with over 20 background colours, over 60 clipart like images and a few text layers for adding quotes/SEO tips from this site to Tweet. With the GIMP meme template it’s really easy to generate images with any combination of background colour and clipart with a couple of clicks of the mouse. 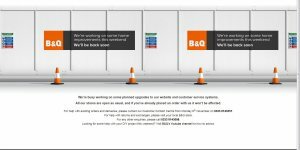 It’s then a simple case of changing the text and exporting the image as a jpg ready to upload into WordPress like any other image. 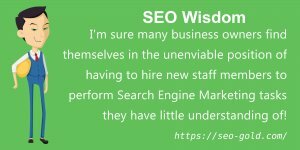 Each one of the SEO quote/SEO tip images I upload to this site creates a WordPress attachment webpage which Google can index/rank and can be shared directly on Twitter etc… either manually or via the Twitter API via a database. By creating the database of Tweets it was a simple matter to schedule the Tweets (via a cron job) rather than having to log into Twitter at the perfect time of day to manually Tweet (how I used to Tweet). 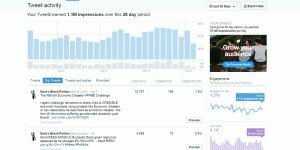 With a constant flow of new Tweets with some linking back to this website both impressions and the click through rate has increased. 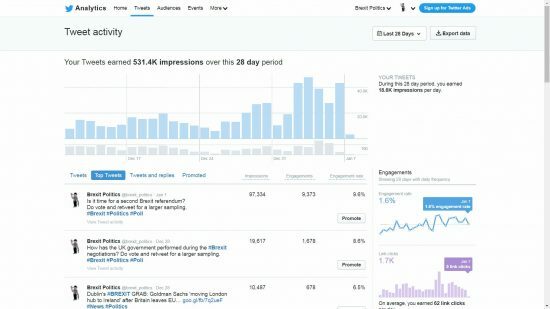 Not as many impressions as the Brexit politics account, but 300,000+ targeted Twitter impressions a month (targeted to SEO, Marketing and similar niches) is nothing to complain about from content that’s just been reused for Tweets!